One of my favourite antique shops in Toronto is Toronto Antiques on King. Cynthia Findlay always has cases and cases full of the most beautiful antique jewelry. 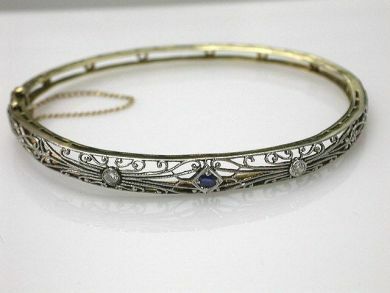 This sapphire bracelet really caught my eye! From her site, "One lady’s 14 karat white and yellow openwork hinged Victorian bangle. One sapphire (0.13 carats). Two old European cut diamonds (0.12 carats: SI2-I1 clarity: H-I colour)".